I’m sure you all know about the 1968 Corvette the guys from Fast ‘N Loud cut up for their Hot Wheels special in December. It has been implied that an entire Gas Monkey Garage series is coming to Hot Wheels. When? Nobody knows. 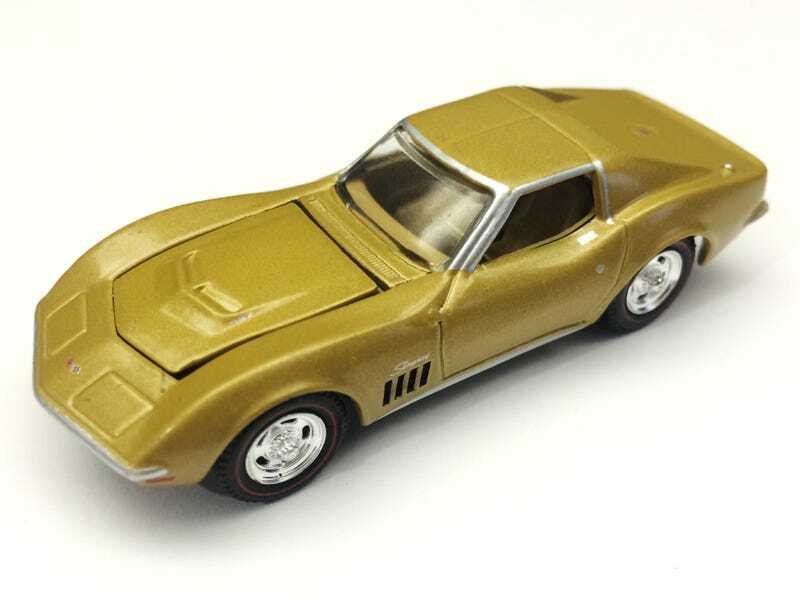 This 1969 Riverside Gold Corvette is called a “Survivor.” The car the Greenlight cast is based on is an unrestored, 427-powered convertible that the Gas Monkey crew sold on eBay a couple years ago (for $24,660 if you were wondering). If the car ever appeared on Fast ‘N Loud, I can’t find it mentioned in episode recaps. I don’t watch the show regularly and my best guess is it appeared briefly and wasn’t a featured car. There is really little to complain about with this cast. It’s a very good 1:64 representation of a C3 and I’ve actually reviewed it before. How is that so? It’s basically the same casting as the Apollo 13 Corvette. I expect that’s because the Apollo is technically a new Vette in the film while the Gas Monkey Survivor Vette is 40-plus years old and unrestored. The unrestored Riverside Gold hue is actually a clever touch. The tires differ between the cars as the Redline-like tires on the Gas Monkey car are actually based on the 1:1 version’s tires. The interior on the Gas Monkey has an inaccurate old gold hue that matches the exterior paint (Apollo interior is black) while the engine bay on the Gas Monkey is painted black (Apollo engine bay is the same as the body color). There are also some slight differences to the plastic engines. The above changes are easy to make (they’re plastic and/or rubber parts), but there are two minor casting differences that really set the Gas Monkey apart from the Apollo. The hood on the Apollo seems to be based on the L88 hood while the Gas Monkey has a lower profile LT1 hood. The Gas Monkey also has the big side louvers (accurate to the 1:1 car) while the Apollo has the fake inset gills of the 1970-72 cars (yay accuracy!). Of course I waited to the end to point out the one flaw with the Gas Monkey cast. The original 1:1 car was a convertible with a hardtop, not a coupe. It would have been cool for Greenlight to do a convertible (sans hardtop) cast for the Gas Monkey car. They’ve done top-down and hardtop convertible C3s before, but went with the coupe here for some unknown reason. I’ve been telling myself for months that I wasn’t going to buy the Gas Monkey car because it’s so close to the Apollo car, but I couldn’t resist when I saw it on the pegs. I passed up the DHARMA Initiative van and the Vacation Wagon Queen Family Truckster because I’m still trying to keep the collection at least somewhat under control.